Abdul Ghani Wahhaj turned 4 years old Monday. He was reported missing late last year. CREDIT: National Center for Missing and Exploited Children via CNN. (CNN) - The rescue of 11 hungry children in Amalia, New Mexico, on Friday began with a mysterious tip delivered to a detective across the country, in Clayton County, Georgia, from where young Abdul-Ghani Wahhaj vanished in November. "We are starving and need food and water," read the message that provided the impetus for the raid on the rural compound near the Colorado border. There, authorities found the emaciated children -- the youngest 1, the oldest 15 -- in a squalid underground trailer, along with three women in their 30s, apparently the youths' mothers. After a standoff, police also took into custody two armed-to-the-hilt men -- one of them Siraj Wahhaj, 40, Abdul-Ghani's father. But they didn't find Abdul-Ghani that day. On Monday, investigators returned and found the remains of a young boy whose identity is awaiting confirmation, Taos County Sheriff Jerry Hogrefe said. 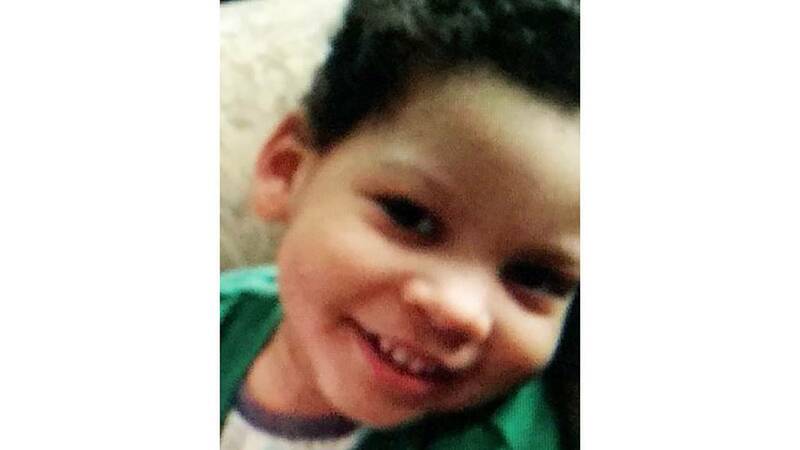 Abdul-Ghani, who turned 4 on Monday, left his home in Jonesboro, Georgia, with his father in late November, Abdul-Ghani's mother, Hakima Ramzi, told police. They left in a 2005 gold Jeep Liberty, supposedly to go to the park, but never came back. Ramzi reported the child missing days later. "When I would ask (Wahhaj) where he was, he said he was on his way, he was coming soon, he was just keeping him for the night," she told CNN. "I haven't seen him since then. ... I don't think his father would intentionally hurt him." Police initially filed no child abduction report because Wahhaj and Ramzi were married -- she filed for divorced in December, Clayton County court documents show. But a juvenile court judge in January issued an arrest warrant for Wahhaj for failing to let Ramzi know where he'd taken Abdul-Ghani. Ramzi said she gets information about the case from the media, and authorities haven't shared any developments with her. She said she did not want to answer too many questions because of an ongoing custody battle. A missing persons report described Abdul-Ghani as 36 to 40 inches tall and weighing 20 to 25 pounds. He needs assistance walking and may be wearing leg braces, the report said. He has a blue birthmark on his back. "I need my son," Ramzi said. "I have all intentions of going to New Mexico to look for my son." In the middle of the night on December 13, almost two weeks after Abdul-Ghani's disappearance but well before a judge issued a warrant for the father's arrest, Wahhaj flipped a Ford Explorer on Interstate 65 in Chilton County, Alabama, north of Montgomery, according a police traffic report. Wahhaj told police he did not recall what caused the single-vehicle crash. He said he left the roadway and when he attempted to swerve back onto I-65, the Explorer rolled and came to rest on its roof, the report said. The police report states the only victims of the crash were a 5-year-old boy and Jany Leveille, one of the women arrested in New Mexico last week. Both were taken to a hospital. There were six other children in the car, ranging in age from 3 to 15. The birth date listed for the 3-year-old does not match Abdul-Ghani's birthday. According to CNN affiliate KOAT, Lucas Morten picked up the group after the accident. Morten was the other man arrested with Wahhaj in New Mexico. Though a search warrant says Abdul-Ghani walks with a limp, the Georgia warrant for Wahhaj's arrest and the boy's mother say he cannot walk. Abdul-Ghani suffers from hypoxic ischemic encephalopathy and suffers seizures, Ramzi said. He requires constant care and medical attention, she said. Hypoxic ischemic encephalopathy is a serious but relatively rare complication affecting infants. According to the National Institutes of Health, it prevents adequate blood flow to the brain and can result in mental retardation, epilepsy or cerebral palsy by age 2. One of the most curious elements of the case is a line in the arrest warrant that says Ramzi claimed Wahhaj "wanted to perform an exorcism on said child because he believes the child is possessed by the devil." The New Mexico search warrants also says investigators had reason to believe Wahhaj planned an exorcism and was denying Abdul-Ghani his medication. Ramzi, however, told CNN that she never claimed Wahhaj sought to perform an exorcism, a word most often associated with Christianity. Instead, Ramzi said, she told police Wahhaj wanted to perform ruqya on the boy. "It's not an exorcism," she told CNN. "That was a translation issue in the court. He just wanted to pray for Abdul-Ghani to get better"
Before conducting the Friday raid, authorities studied the property, which hosted the underground trailer covered in plastic and surrounded by tires and an earthen berm. "Aerial surveillance of the property has been conducted by (the) FBI which documented adult males, females and children present at the compound but none of these persons (is) yet identified, except that one child was observed walking with a limp," the New Mexico search warrant says. It's unclear if the child with the limp was Abdul-Ghani, but the Taos County Sheriff's Office said the boy may have been at the compound recently. "None of the adults would give (statements) to the current whereabouts of AG Wahhaj," its statement said, "but it is reasonably believed he was there a few weeks ago. The investigation into locating him is ongoing."